- The Christain Giovanardi Orchestra was formed in 1995 LA PLANCHE A DIXIE.. In this musical group the driving force is a instrament called the WASHBOARD. for many occations from trio to septet depending on the budget. - LA PLANCHE A DIXIE is a acustic tradtitional jazz band who can perform indoors or out and any occation that would like to be enhanced by the joyfull music they perfom. 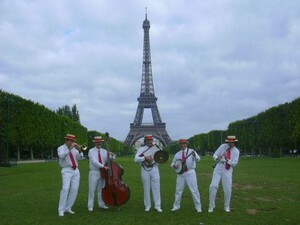 LA PLANCHE A DIXIE performs regularly in Germany ,Holland, Luxemburg ,and throughout France fo your listening pleasure.